I love working with fleece. It’s partly the sheer enjoyment of taking something which is walking around in a field up the hill and turning its wool into a something I enjoy wearing. I suppose it’s control of the means of production, or maybe it’s an eco thing – total wool miles? About three. But that doesn’t explain the stash, if you can call it that. At least the insulation it provides should mean I spend less on heating this winter. I don’t know how it happens, honestly; it’s nothing to do with me. It’s like homing pigeons, except I have homing fleece. I’m sticking to this explanation, by the way, in defiance of the evidence. Evidence like a couple of weeks ago, when a friend (or perhaps that should be ‘enabler’) took me along to a local farm. 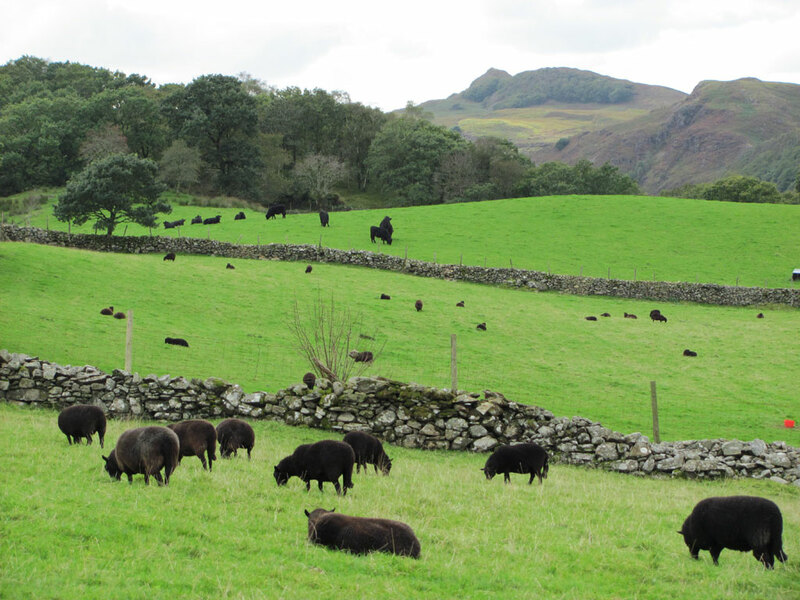 A local farm with a prize-winning flock of Black Welsh Mountain sheep. We went with the express purpose of buying fleeces. No beating around the bush, no protestations that we were ‘just going for a look’. Oh no, we were in the market for woolliness, and we’d got orders from other addicts, too. So we spent time in the sheds looking over the shearling fleeces, getting over-excited and stuffing eight of them into bin liners (they’re not all for me, really). 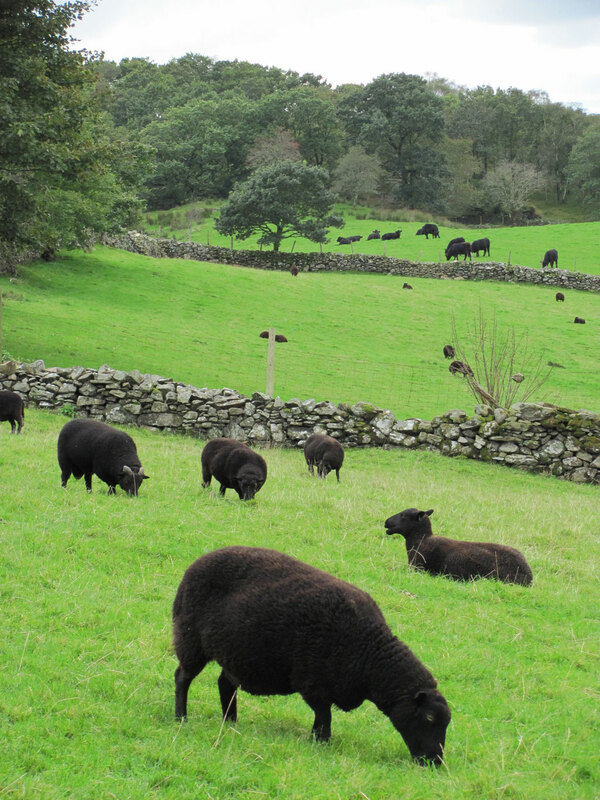 Then we went to look at the sheep living up to their name, being undoubtedly black, Welsh and living in the mountains. It’s so good to see something which is so perfectly in its place. And they’re attractive sheep anyway, with their deep colouring and longish bare legs. I think it must be the deep blackness of their legs – they’re definitely wearing high-density opaque tights – that makes them look chic even when they’re sliding down a slope and sneaking into the barn in search of something to eat (that would be Paxo, so named because he stuffs himself and once ate the stock book). And this particular flock are so dark in colour. 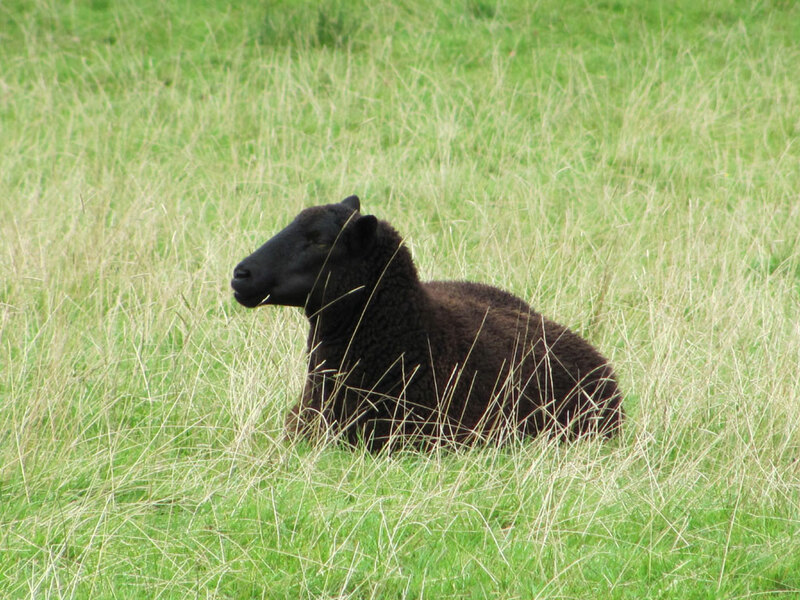 I’ve seen Black Welsh fleeces that have been almost charcoal grey, I’ve seen some that have been Worcester Sauce brown, but I’ve not come across any that are this deep a black. I’m just learning about fleeces for spinning, but my companion has much more experience, and she tempted me there with this promise (plus I’m a sucker for a coloured fleece). She was right. And I got my other fleece, so step 1 is accomplished. Things fell apart slightly with step 2. Fleece blows away. Weigh fleece down with rocks. Which way up is sheep? 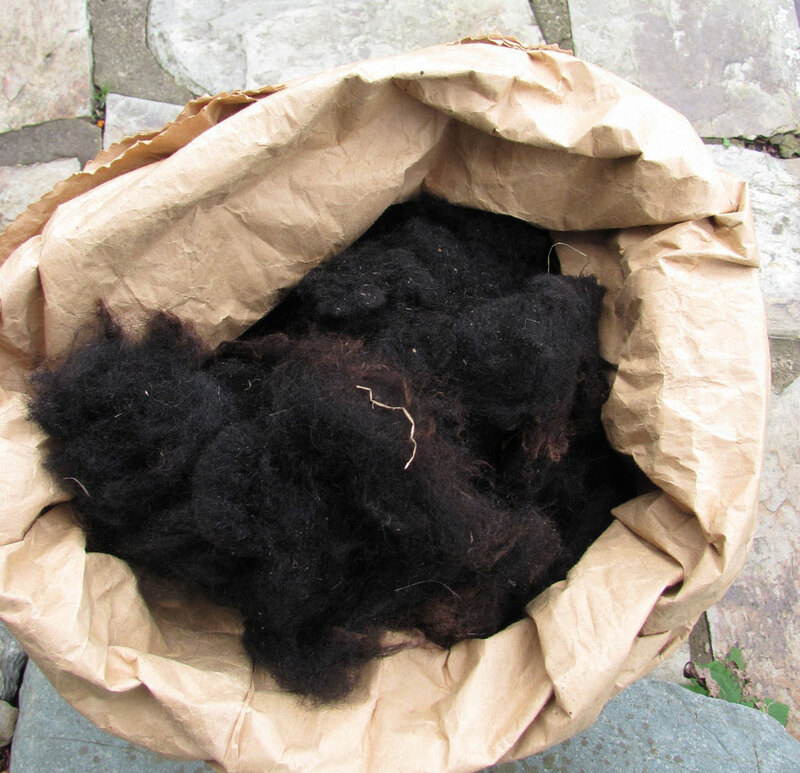 Poo prevalence no guide – fleece pooey in all directions. Remove edge. This involves lifting rocks. Fleece blows away again. Retrieve fleece from hedge. Weigh fleece down with more rocks. Remove some fleece from middle, most of freed fleece blows away again. Retrieve bits of fleece from hedge, return to find Next Door’s Cat enshrined in fleece, toying with it lightly. Attempt to remove cat from fleece. Cat objects. Get water spray. Water spray cat, fleece and self (owing to wind). Cat runs off, fleece blows away, again. Retrieve fleece from hedge, fence, shrubs, bottom garden. Replace fleece in bag, bit awkward owing to wind. Return fleece to shed. Find gin. I could just order tops online. I could… but it wouldn’t be the same.